I remember reading about the idea of Math Taboo on Sam Shah’s blog, this post by Bowman Dickson. I feel like I had the idea independently, but it seems like many people have, by doing a cursory Google search of the phrase. Unfortunately, there are lots of posts ABOUT math taboo, but no real materials provided. If I have seen anything, it’s a lesson plan on having the students make their own. Or I saw one for sale, but it was for the elementary level. So I made one myself. My co-teacher and I went through all the Integrated Algebra regents given since 2008 and pulled out any words that it’s possible a student might not know. I also went through my own lessons and pulled out any vocabulary I had given them. Below is the .pdf for printing your own (I used card stock and laminated), and two .doc templates if you’d like to make more, or alter the ones I have. I made a total of 126 cards (63 double sides – maybe slightly overboard). Since I found no others, it makes sense to share. cool! thanks for sharing. I never made a card set, just did it as a class with the projector (small classes), so this is really nice. i might print a set just to keep in the classroom. How exactly did you do it with a projector, if the guessers are not supposed to see the card. Have them turn their backs or put their heads down? Or were you the only clue giver? oops, just saw this now. yeah, i had the whole class line up in two lines with the people guessing stand at the front of the room back to the projector. then the people in the front of the lines did the describing. I found your blog through f(t). 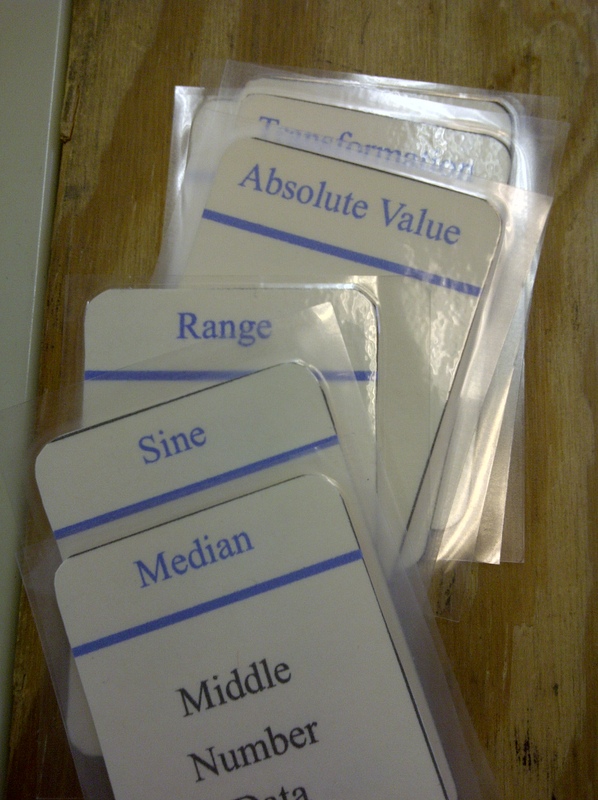 I really like the idea of a Math Taboo game. I hope to try it next school year and give you some feedback. Thanks for the idea. I noticed in your blog post you mentioned finding a set of Elementary math Taboo cards for sale, but I am having trouble finding them. Do you happen to remember the site where you found them. I am an elementary math learning specialist and would love to have this game to share. Thanks so much for sharing!! I will use these next year! Thanks for sharing. I used this game a lot when I taught English but I haven’t tried it with math. Looking forward to using it with my 8th graders. Thank you so much for sharing. I am going to love using this this year. 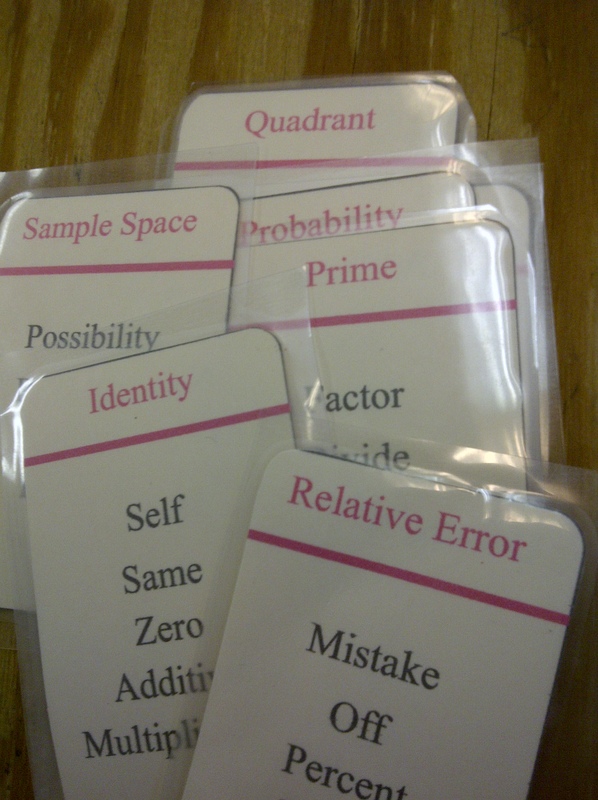 I’ve been hoping to find a math or science taboo game for years that didn’t require me making a million cards. This is wonderful – thanks so much for sharing! How awesome!! Thanks for sharing!! These are really useful. They must have taken ages to do. Thanks. Often I wouldn’t read through post on blogs and forums, nonetheless prefer to claim that that write-up very required me personally to view as well as undertake it! Your way of writing may be pleasantly surprised me personally. Many thanks, quite wonderful content. This is awesome! I shared the link to this on my blog, keep inspiring! Thank you for sharing … you ROCK! I can’t wait to update these for use in my inclusion geometry classes. Thanks for sharing. Thank you SO much for sharing. I’m teaching algebra for the first time next year and this is such a fun idea and a time saver. You are wonderful! Such an awesome resource!!! Thank you so much!! What is the difference between pink and blue cards? You are absolutely fantastic. It seems teachers are being nickel and dimed these days. Thank you so much for sharing. Thank you very much for sharing. really looking forward to using these.